The Delta II rocket has launched on its 150th flight on Saturday, departing from Cape Canaveral’s Space Launch Complex 17 for the final time on the second of two launch opportunities – at 9:08am Eastern (13:08 UTC). 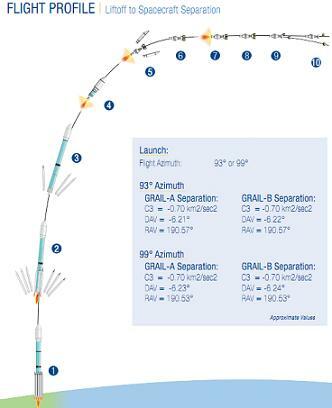 The rocket is carrying NASA’s two GRAIL spacecraft, which will be used to study the Moon’s gravitational field. GRAIL, or Gravity Recovery And Interior Laboratory, is a two-spacecraft mission being flown as part of NASA’s Discovery programme. It is expected to yield a better understanding of the Moon’s internal structure and thermal evolution. This will allow scientists to formulate a model of the Moon’s formation which can also be applied to terrestrial planets. The principal scientific objectives of the GRAIL mission are to produce a map of the Moon’s lithosphere, to allow scientists to understand the Moon’s thermal evolution, and the evolution of breccia within the Moon’s crust, and to determine more details of the Moon’s interior, particularly the size of the Moon’s core, and the structure beneath impact basins. The Ka band transponder forms part of the Lunar Gravity Ranging System or LGRS, which is GRAIL’s primary instrument. LGRS consists of four elements; the Ultra-Stable Oscillator, or USO, will be used to generate an oscillating signal to synchronise the instruments. This signal will then be transmitted through both the Microwave Assembly (MWA) and Time-Transfer Assembly (TTA) antennae. TTA broadcasts the signal as a ranging code, similar to those transmitted by Global Positioning Satellites. Finally, the data is collected by the Gravity Recovery Processor Assembly, or GPA, which processes it for transmission back to Earth. The two spacecraft also carry the Moon Knowledge Acquired by Middle school students, or MoonKAM, student outreach payload. This will be used to image areas of the Moon at the request of schoolchildren. A similar programme for Earth imagery, EarthKAM, has been operated aboard the International Space Station since 2001 and also flown on Space Shuttle missions STS-89 and STS-99. A prototype, KidSat, was also flown on STS-76, STS-81 and STS-86. 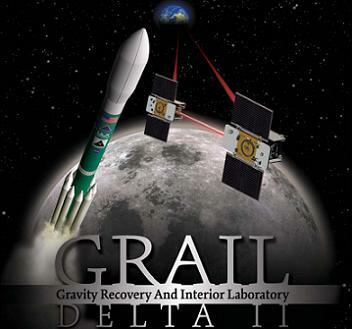 GRAIL is the eleventh mission to be launched as part of NASA’s Discovery programme, which was started in 1992. Discovery is a medium-class programme intended to study the Solar system. many of NASA’s recent planetary missions have been conducted as part of it. The first Discovery mission, NEAR, was launched in February 1996 to explore the Asteroid 433 Eros. The next mission, Mars Pathfinder was launched in December 1996, placing a lander on Mars, and deploying the Sojourner rover. The third mission, Lunar Prospector, was launched in 1998 to study the lunar surface via spectroscopy. In 1999 the Stardust spacecraft was launched to return samples from the comet 81P/Wild 2. These samples were returned in January 2006, and the spacecraft subsequently performed an extended mission with a flyby of 9P/Tempel 1 this February, before finally being deactivated on 24 March. The Genesis spacecraft, launched in August 2001, was the fifth Discovery mission. It collected a sample of solar wind, and returned it to Earth. During its return to Earth, its parachute failed to deploy, however some of its samples were still usable. The sixth mission, CONTOUR, was less successful. Intended to perform flybys of comets 2P/Encke and 73P/Schwassmann-Wachmann 3, CONTOUR was launched in July 2002. The spacecraft was destroyed due to a malfunction of an onboard kick motor which was intended to propel it out of Earth orbit towards its first comet encounter. MESSENGER, the seventh mission, was launched in August 2004 and entered orbit around Mercury on 18 March this year. The eighth mission, Deep Impact, fired a probe into the comet 1P/Tempel 1, in order to study its composition. Launched in 2005, its impactor hit Tempel 1 in July of the same year, with the spacecraft then being used for an extended mission to 103P/Hartley 2. The ninth mission of the programme, Dawn, was launched in September 2007, and entered orbit around the Asteroid 4 Vesta on 16 July this year. Following a year orbiting Vesta, it will depart for the dwarf planet Ceres, which it will also orbit. The tenth mission, Kepler, is a space telescope which is being used to look for exoplanets. It was launched in 2009. GRAIL was launched by a Delta 356, which is a Delta II Heavy flying in the 7920H-10C configuration. It was the sixth and possibly last Delta II Heavy to be launched. Overall, its launch marked the 150th Delta II mission, and potentially its penultimate flight. The Delta II 7920H-10C configuration consists of an Extra-Extended Long Tank Thor first stage with an RS-27A engine, fuelled by RP-1 propellant and liquid oxygen oxidiser. Early in the ascent the first stage was augmented by nine GEM-46 solid rocket motors; six of which ignited at launch, and the other three shortly before the first six burnt out. The second stage was a Delta-K, powered by an AJ-10-118K engine. The second stage is fuelled by Aerozine-50 propellant, with dinitrogen tetroxide being used as an oxidiser. The 7920H-10C configuration does not incorporate a third stage. A three metre, or ten foot, composite payload fairing encapsulated the spacecraft. In the mid-1980s, launches of Delta rockets were winding down, with future payloads expected to fly aboard the Space Shuttle. Following the Challenger accident in 1986 this policy was reviewed, and in January 1987 the US Air Force ordered a new series of Delta rockets, primarily to launch Global Positioning Satellites. The Delta II made its maiden flight on 4 February 1989, in the 6925 configuration. The 6000-series Delta IIs were built as an interim whilst the more capable 7000-series was in development. It used an Extra-Extended Long Tank Thor first stage powered by an RS-27 engine, a Delta-K second stage, and nine Castor-4A solid rocket motors. The 7000 series, which first flew in November 1990, introduced an uprated RS-27A engine, and GEM-40 solids. The 6000-series made seventeen flights; three in the 6920 configuration and 14 in the 6925 configuration. Its final flight was made on 24 July 1992, carrying the Geotail spacecraft to study Earth’s magnetosphere. Other 6000-series payloads included nine Block II GPS satellites, four commercial communications satellites, and SDI technology demonstration experiment and two astronomy satellites; EUVE and ROSAT. The 7000 series has seen a wider variety of configurations, with the Delta II Lite programme resulting in the development of configurations with three or four solid rocket motors, and launches being made with two or three stages, and with two different types of third stage. In all, 127 have been launched; ten in the 7320 two-stage configuration with three solid rocket motors, thirteen in the 7420 configuration with four SRMs, and twenty seven in the 7920 configuration with nine SRMs. The 7326 configuration made three flights and the 7426 made a single flight; these had three and four solid rocket motors respectively, and both had Star-37FM third stages. The 7425 configuration, with four solid rocket motors and a Star-48B third stage, made four flights. The most-launched configuration is the 7925, which features nine SRMs and a Star-48B upper stage, and has made sixty nine flights. The Delta II Heavy has the same configuration as the 7000 series, except that it has more powerful solid rocket motors. The GEM-46 motors, which were originally developed for the Delta III, allow the rocket to carry a heavier payload into orbit. The Delta II is statistically the most reliable rocket in service, having only failed twice. Both failures were of 7925 configuration rockets, and both were caused by problems with the solid rocket motors. In August 1995, during the launch of Koreasat 1, one of the nine solids failed to separate after burning out. 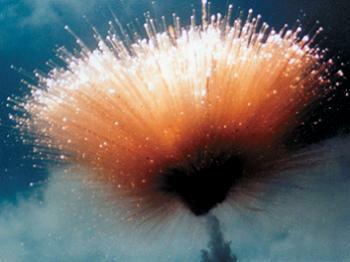 The rocket continued to orbit, however the additional mass of the spent solid rocket motor resulted in it reaching a lower orbit than had been planned. The satellite was able to raise its own orbit, but at the expense of a significant amount of fuel. The second failure occurred in January 1997, during the launch of the first Block IIR Global Positioning Satellite, GPS IIF-1. Thirteen seconds into the flight, the rocket self-destructed following the structural failure of one of the number 2 solid rocket motor. Over 220 tonnes of debris fell within a kilometre of the launch pad, with one piece landing in the blockhouse car park, destroying twenty vehicles. An investigation concluded that recent changes in equipment used to transport the solid rocket motors had resulted in pressure being put onto an area of the booster, and that this had caused a crack to form around six seconds after launch. 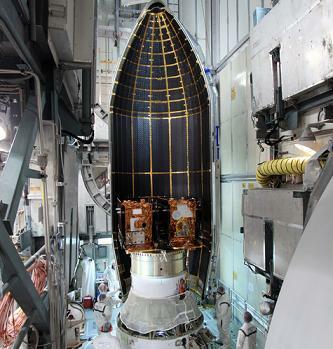 The equipment was redesigned, and additional inspections were added for future launches. The Delta II has not failed in any of the ninety four launches it has made since then. Delta 356 could have launched GRAIL in one of two instantaneous launch windows available per day. The first of these windows opened at 8:29:45am Eastern (12:29:45 UTC), but was not taken due to unacceptable upper level winds. The second launch opportunity was, however, taken at 9:0am Eastern (13:08 UTC). Had the vehicle launched during the first window, the rocket would have flown on an azimuth of 93 degrees. During the second window, an azimuth of 99 degrees was employed. About two seconds before launch, the RS-27A main engine ignited, along with two LR-107-AN-11 vernier engines. About two tenths of a second before the scheduled liftoff time, six of the nine solid rocket motors ignited. At T-0, Delta 356 was released to begin its ascent into orbit. Twenty nine seconds into flight, the rocket was travelling at Mach 1, the speed of sound. Around 79 seconds after liftoff, the three remaining solid rocket motors ignited. A second and a half later the six ground-lit solids were jettisoned in two groups of three, having expended their fuel. The three air-lit motors also burned for 80.5 seconds, before they too were jettisoned. Around 263.2 seconds after launch the first stage depleted its fuel, and its main engine shut down, an event designated Main Engine Cutoff, or MECO. Shortly afterwards, Vernier Engine Cutoff, or VECO, occured, when the two vernier engines also shut down. Eight seconds after MECO the first stage was jettisoned, and five and a half seconds after that the second stage’s AJ-10 engine ignited. The payload fairing was jettisoned 4.3 seconds after second stage ignition. Events after fairing separation tracked slightly different times, based on the 93 or 99 degree flight profile. In the 93 degree flight profile, the first burn of the second stage was to last 153 seconds. With the 99 degree profile used, it was seven tenths of a second longer. The first burn was followed by a long coast phase, lasting 58 minutes and 40.6 seconds for the 99 degree profile. After coasting, the second stage ignited for its second and final burn, lasting 271.7 seconds on the 99 degree profile. Nine and a half minutes after the second burn was complete, separation of the first spacecraft, GRAIL-A, occured. The upper stage was then manoeuvred, before the separation of GRAIL-B, which occured eight and a quarter minutes after that of GRAIL-A. A RocketCam mounted on the second stage was used to verify that separation had taken place. Shortly after launch, the GRAIL spacecraft will deploy their solar arrays as they pass into sunlight for the first time since separating from their carrier rocket. 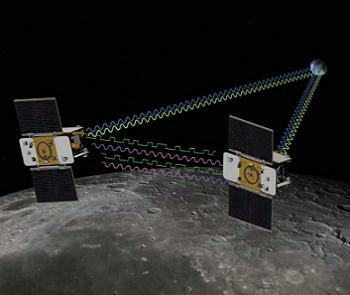 GRAIL will travel to the Moon on a low-energy trajectory, via the Sun-Earth Lagrange 1 point. The spacecraft are expected to enter selenocentric, or lunar, orbit between 31 December and 1 January. The spacecraft will subsequently manoeuvre into lower orbits, before they are moved into formation to begin collecting scientific data. At the start of the scientific phase of the mission, the spacecraft will be in circular orbits at an altitude of 55 kilometres. Scientific operations are expected to commence on 8 March next year, and last for 82 days. Decommissioning of the spacecraft will begin on 29 May, and the spacecraft are expected to impact the lunar surface in June. Delta 356 was the last rocket planned to depart from Cape Canaveral’s Space Launch Complex 17. 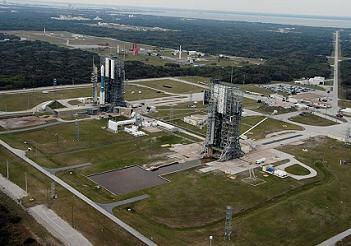 It launched from SLC-17B, SLC-17A having been closed in 2009. Launch Complex 17, as it was then designated, was built between August and December 1956 to accommodate tests of the Thor missile. The first Thor launch occurred from LC-17B on 26 January 1957, however it ended in failure when the rocket lost thrust and exploded on the launch pad. A second launch in April was erroneously destroyed by range safety after a faulty console caused the RSO to believe the rocket was flying in the wrong direction. The first successful launch occurred on 20 September, also from LC-17B. Missile tests were made from LC-17B until 1957, after which it began to be used for orbital launches. The first orbital launch to be made from the pad occurred on 13 April 1960, when a Thor-Ablestar launched Transit 1B. 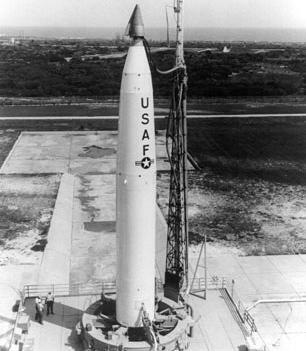 The last of ten Thor-Ablestar launches from the pad occurred in May 1962, after which Delta launches from LC-17B began. The first Delta launch from LC-17B was of Delta 11, carrying Telstar 1, the first commercial communications satellite. The pad was subsequently used by Delta A, B, C, E1, G and C1 rockets between 1962 and 1969. Between 1963 and 1965, six suborbital flights were also launched from LC-17B, carrying ASSET reentry vehicles to demonstrate technology for the X-20 DynaSoar spacecraft. Three of these launches used the single-stage Thor DSV-2F, and the other three used the two-stage Thor DSV-2G, which included a Delta upper stage, however its launches are not officially listed as Delta launches. None of the six ASSET flights reached space; instead they flew shallower atmospheric flight profiles. Delta launches from LC-17B resumed in September 1972, when the Delta 1000-series started using LC-17B. The 2000-series began to launch from the pad in 1974, with the last Delta 2000 launch from the complex occurring in 1979. From 1983 to 1989 it was used for Delta 3000-series launches and the short-lived interim Delta 4000 series made both of its launches from LC-17B; the first on 27 August 1989 and the second on 12 June 1990. Delta II launches from LC-17B began on 11 December 1989. On 8 January 1991 the first Delta II 7000-series launch from LC-17B orbited a NATO communications satellite. In the mid 1990s LC-17B received modifications to accommodate the Delta III rocket, and in 1997 it was redesignated Space Launch Complex 17. The first Delta III launch occurred on 27 August 1998, carrying the Galaxy 10 satellite. The mission ended in failure after the vehicle’s solid rocket motors ran out of hydraulic fluid, resulting in a loss of control and the destruction of the rocket by range safety. The second Delta III launch in May 1999 also failed, after the second stage engine’s combustion chamber ruptured, leaving the Orion 3 communications satellite in a useless low Earth orbit. A third launch with a mock-up satellite also underperformed, reaching a lower than planned orbit. After these failures the Delta III was retired. Because of its modifications to accommodate the Delta III, SLC-17B is the only launch pad which can accommodate the Delta II Heavy. The first launch of the Delta II Heavy occurred on June 10, 2003, carrying the Spirit spacecraft bound for Mars. Launches of standard 7000 series Delta IIs continued throughout the time that the Delta III and Delta II Heavy have used the pad, with the most recent launch from the complex having been made in September 2009 carrying the two STSS-Demo satellites for the US military. 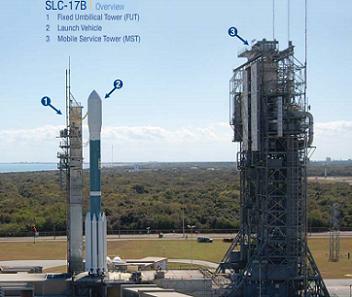 In total GRAIL is the 164th launch to have been made from SLC-17B. Payloads launched from the pad in the past include Telstar 1, Syncom 1, Pioneers 8 and 9, Wind, NEAR, Mars Pathfinder, Mars Polar Lander, WMAP, the Opportunity rover, Spitzer, MESSENGER, Deep Impact, STEREO, THEMIS, Dawn, Fermi and Kepler. The other pad in Space Launch Complex 17, SLC-17A, was used for 161 launches, beginning with a Thor test flight on 30 August 1957. The pad was used by Thor DM-18, Thor-Able, Thor-Delta, Thor DSV-2D rockets, followed by the Delta A, B, C, D, E, E1, G, L, M, M6, N, 2000 and 3000 series. From 1989 Delta II launches were made from the pad, using both the 6000 and 7000 series configurations. The final launch from the pad was of the last GPS IIR satellite, in August 2009. The launch of GRAIL was the second of three planned Delta II launches this year. The next launch is the last currently on the manifest; however components to produce five more rockets do exist. 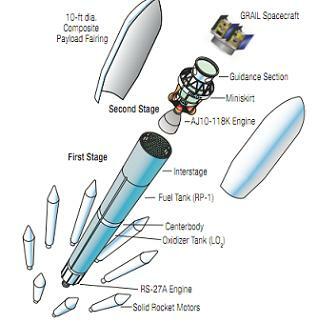 These components are for the Delta II Heavy configuration, however United Launch Alliance has stated that they can be converted to regular 7000-series rockets, which would be able to launch from Vandenberg Air Force Base without modifications to the launch pad. NASA is currently considering restoring the Delta II to its list of available launch systems after repeated failures of the Taurus-XL rocket. The remaining Delta II launch is also United Launch Alliance’s next scheduled mission. It will carry the NPP weather satellite for NASA and NOAA, and is scheduled to launch from Vandenberg Air Force Base at the end of next month. Excess capacity on the rocket will be used to launch several small satellites.